Barcelona defender Samuel Umtiti showed he has a sense of humour after his handball that gave away a penalty in France’s opening World Cup game today. 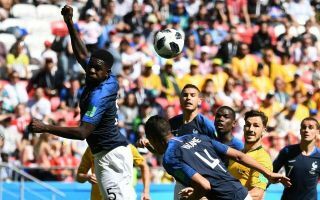 Les Bleus ran out 2-1 winners over Australia but were made to work for it as Umtiti’s moment of foolishness handed their opponents a way back into the game. Umtiti raised his hand bizarrely high in an attempt to block the ball, and only he can really know what he was thinking at the time with such an ill-advised move. There must have been some memes doing the rounds – either that or Umtiti came up with this gem himself as he shared it via his Instagram page. The 24-year-old is generally regarded as one of the most solid centre-backs in the game after shining for Barcelona, but France will need him to do better than this if they are to progress in the World Cup this summer. Regarded as one of the pre-tournament favourites, Didier Deschamps’ side looked far from at their best today but ultimately had enough to scrape the three points.